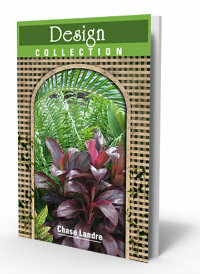 Layers of rich green, deeply divided leaves makes philodendron selloum the star of South Florida's tropical gardening. This plant works as a tropical shrub, and may climb a nearby fence or tree (it won't hurt the tree). However, if you want a true climber, try 'Monstera deliciosa' philodendron - sometimes called "Swiss Cheese Plant." Selloum grows a trunk eventually though you won't see much of it when the leaves droop over each other in dense layers. 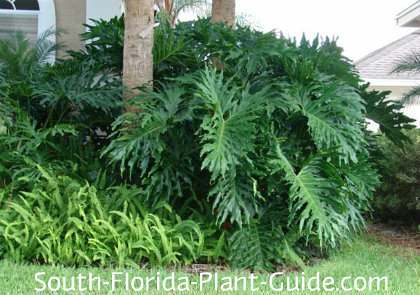 If being big, fat and fabulous is too much of a good thing for the planting area you've got, there's a smaller lookalike variety, Hope philodendron, which only grows to 4 feet, and the smaller mounded Xanadu. This plant contains toxins that can cause harm if ingested. Keep this in mind when placing it if you have any munchers in the family. If you have sensitive skin, wear gloves when handling. This plant can grow 8 to 10 feet tall and 6 feet or more wide. It's a moderate grower that takes sun or shade but seems to prefer part sun to part shade. 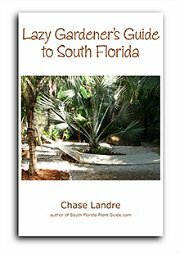 These are tropical plants that do best in Zone 10, though they will do fine in Zone 9B if given cold protection. You can also grow them in large containers to bring inside during cold snaps. Philodendrons are considered deer-resistant and generally bugs don't like them either. No trimming is needed other than to remove an old leaf and stem. This plant can't be cut back for size, so make sure its ultimate height and width will work in your landscape. If cold damages an established selloum it may die all the way back but send up new sprouts in spring. Water regularly but give the plant time to dry out between waterings. Philodendrons cannot take a wet area - they'll rot. 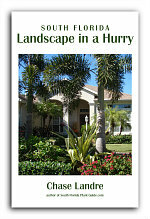 Fertilize 3 times a year - in spring, summer, and autumn - with a quality granular fertilizer. Place 5 feet apart and the same distance from nearby shrubs. If planting by a tree, you can go much closer. Along a walk or drive, come in at least 4 feet - more if you can to accommodate the mature size. Come out from the house 4 or 5 feet. These work very well in containers as long as you don't keep them overly wet. 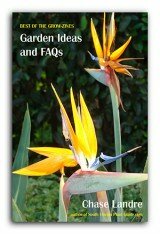 COMPANION PLANT SUGGESTIONS: White bird of paradise, variegated arboricola, angel's trumpet, podocarpus, dwarf tibouchina, pinwheel jasmine, and orange bird of paradise.